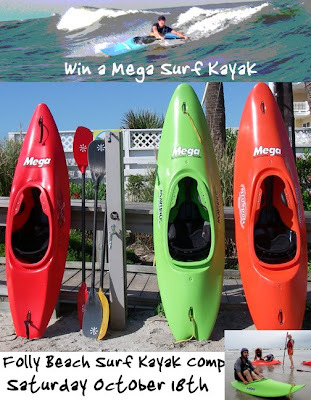 Mega Kayaks will be the chief sponsor for the Charleston Parks and Rec Surf Competition at Folly beach this year. So among other great prizes there will be a chance for all who take part to win a Mega HDP surf kayak. Brought to you by SC&K. See you there. Contact Josh or Wendy At Charleston Parks for an entry form and more details. The Coast Guard Auxillary will be offering a boating course for 'The Weekend Navigator' beginning September 16th. The class will meet at 761 Wheaton St and run for 7 tuesday nights. There is a $50 fee for course materials. Call Kent Shockey at 912 897 7656 for all the details.. Here is our latest commercial...possibly for the F/Stroke DVD. Not completely sold on it yet. Glad to say the weather now is great for all paddling. We had some pretty rough seas for a few days last week...waves were hitting the underside of the pier. It seems that August is the new October and June seemed alot like August. Whatever ! The forward stroke video is well under way and we hope to have it completed by the deadline. Surf season is fast approaching and a whole new batch of surf boats will be arriving soon. We are very excited about the new Riot line. Tropical Storm Shuts Us Down. T.S Fay continues on a drunken northerly path. We have cancelled all programs from Wednesday to Friday. Give that man a Darwin Award. 1. A monsoon is a wind, rather than rain. 2. Dolphin pods have no leader. 3. Lake Baikal in Russia holds about a fifth of the world's fresh water. 4. Many businessmen believe biscuits are key to clinching deals. 5. Some slugs are carnivores, and have razor-sharp teeth. 6. Nelson Mandela was still on the US terror watch list until last month. 7. Eating a big breakfast helps weight loss. 8. Flowers wave at passing insects to get their attention. 9. The language of space is English. 10. Seals can navigate from the position of stars. 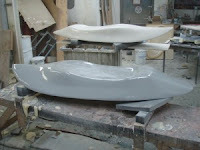 In Fall 2009 Riot will introduce three brand new Surf Kayak designs, manufactured in carbon/kevlar, composite layups for performance ocean surfing. The three models include the Ninja 6′8″, Ninja 7′6″ and Sword IC. SC&K will be one of the first locations on the East coast to have the line up in stock. Expected arrival of the Ninjas and Sword is October 2008. They will be available to purchase in one very light layup and one color...probably red. Thursday 7th Aug -The cameras rolled and the band played as Shorty O'Brian made his bewildered way to the ocean. And tears of joy and sadness flowed on the faces of over 1000 people who came to witness the touching and well publicised event. 'Come see the turtle release" read the big banner on the side of Hwy 80. Yes, Tybee has discovered it's publicity mascot and is learning quickly how to exploit it. Good luck to you Shorty, tell your friends how crazy humans are and don't come back ! Nigel Ranks 18 in 08'World Cup. Nigel Qualifies for Surf Kayak World Cup. The Surf Kayak World Cup takes place next month on the west coast of France. And geuss who qualified ? The second place win at East Coast qualifier earlier this year was enough to secure a place. Wow moma! "It's quite a big surprise. I'm not sure if I'm ready for such lofty promotion." said Mr Law this morning. " "I feel I have a lot of work to do before showcasing my style on the international scene, dude"
Surfing the East coast is a big step away from a West coast and there is little time for a period of intense training. We will see what comes of this. Posture, power, paddle and protection was the subject of Mr Lawry's interactive lecture last night. And so with a bunch of blade less paddle shafts we set out to prove to ourselves how to get the most from body-boat-paddle relationship. Ben has a creative teaching style, as any good 'IT' should . He does introduce interesting and different concepts as well as dressing up the old one's in new packaging. The Forward Stroke video will contain a lot of what Ben covered and will be available by the end of the month. We had 10 participants last night who now have 10 new things to think about just to paddle in a straight line.